Yesterday we had a Space Party and did lots of fun Space activities. We all got in a spacesuit that our teacher made out of a cardboard box. We thought it was exciting! There were five other stations too. Our favorite station was making Atomic Slime Goo that glows in the dark! We made the slime glow by using a black light. We lit up too! 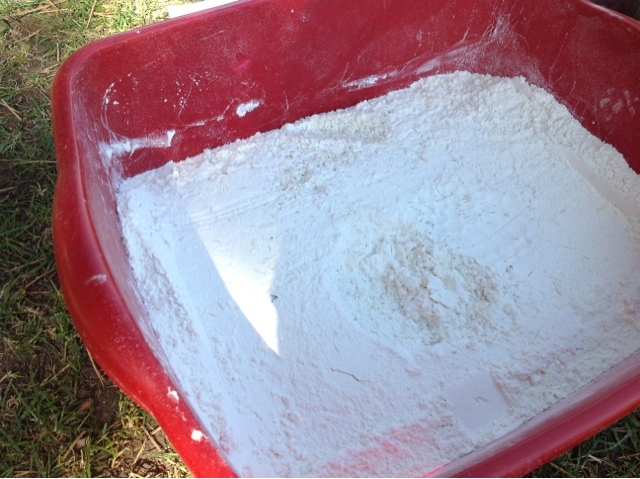 One of our other favorite stations was making Moon Sand and playing with it. We made moon sand castles and it was very, very fun and interesting. We hope you enjoy our video! Today our retiring Kindergarten teacher, Mrs. Van Nice, came to our classroom to read us 2 of the 5 Children's Choice Award Nominees for this year. All we have to say is that it is going to be HARD to vote for just one! 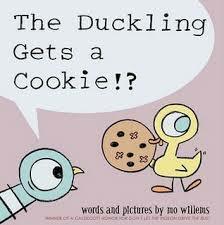 Mo Willems made the list again with his sweet book, The Duckling Gets a Cookie. We have a soft spot for Mo Willems and will be adding this book to our collection for sure! 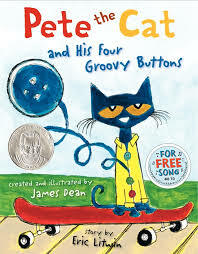 The second book Mrs. Van Nice read to us was Pete the Cat and His Four Groovy Buttons by James Dean. LOVED!!!!!!!!! If you click here you can visit the Harper Collins website and enjoy listening to the author read the book to you. You will not be disappointed! We promise. We can hardly wait for tomorrow. We will be reading Nighttime Ninja by Barbara Decosta. Click here to read all about the Children's Choice Book Awards. 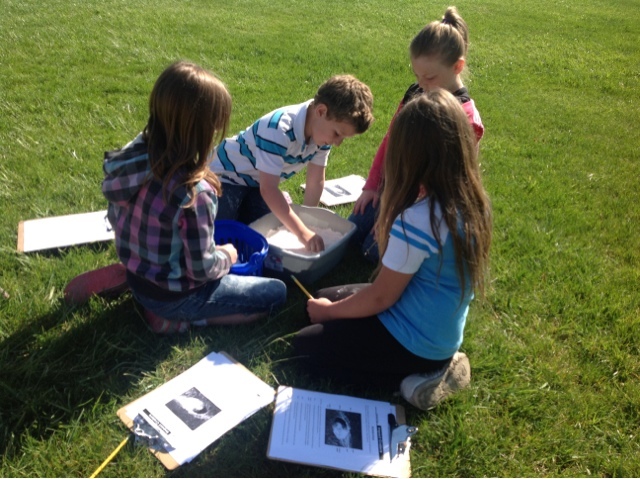 Today in science we were exploring the idea of impact craters. We were trying to figure out how velocity (speed), angle of impact and size & shape of an impactor (meteorite, asteroid) effected the size and shape of an impact crater. 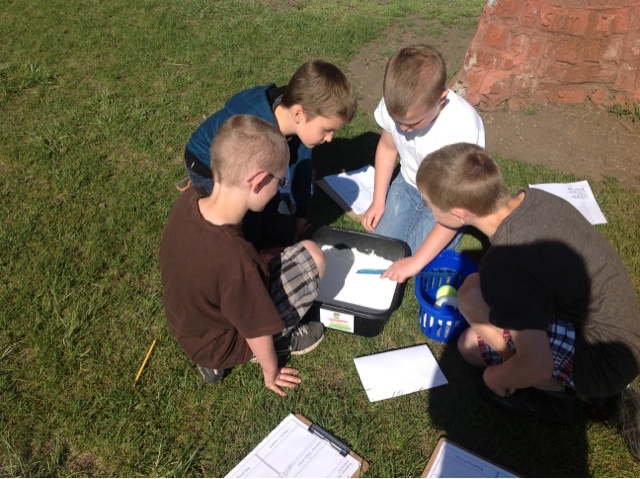 Jakob, Justin, Jaden and David discovered that not all impactors created the same size crater. The large, not solid, baseball they used created a shallow crater. They thought that if the baseball was solid it would probably make a deeper crater. 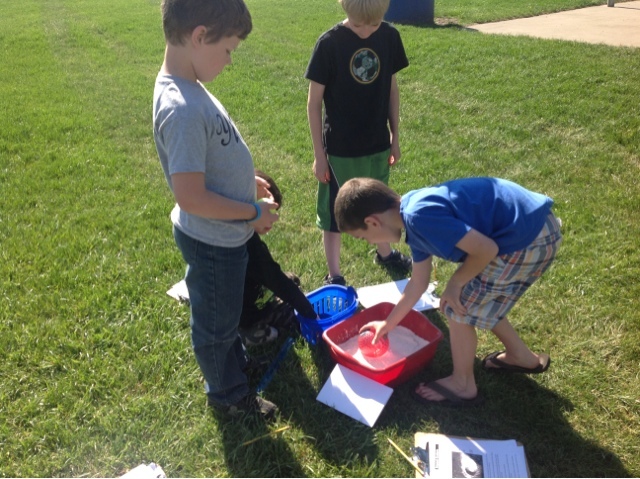 Tanner, Taylor, Greyson and Terrell noticed that the faster the impactor was thrown the more central uplift they got. In addition to this they discovered that not all central uplifts were big. They also noticed that when you throw small impactors fast (high velocity) you get big craters. Collin, Kami, Lydia and Falisha figured out that if you throw a small impactor slow (without much velocity) you get a small crater and if you throw the same impactor faster (increase the velocity) you get a bigger crater. Tomorrow we will continue our research and analyze our data.